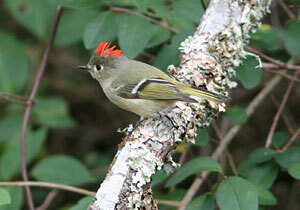 Profile by Maria Hart: The Ruby-crowned Kinglet is a pocket-sized songbird that is green-gray in color. They make up for their meager size with their boisterous and harsh ‘jid jidt’ call that can be heard throughout the woods. A good way to identify these tiny birds is by their white wing bar that has a black bar directly underneath. Adult males can be seen from time to time with a radiant red crown when excited by a possible mate, competitor, or predator. 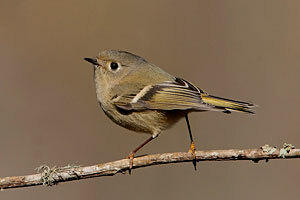 When the crown is not visible, Ruby-crowned Kinglets can still be distinguished from the similar species, Golden-crowned Kinglets, by their distinct white eye ring. 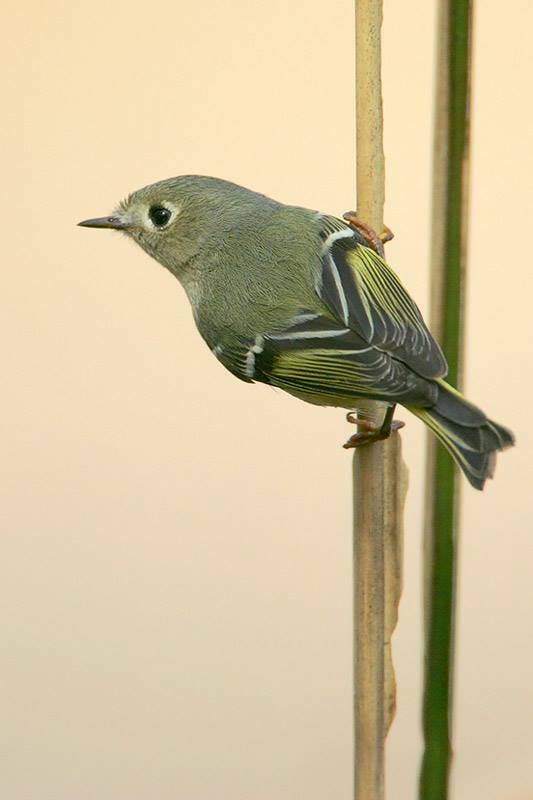 During the winter months, Ruby-crowned Kinglets can be found high in the treetops of open deciduous forests within the southern and southwestern regions of the United States, as well as in parts of Mexico. They breed in tall and crowded evergreen forests in the northern portion of the United States. 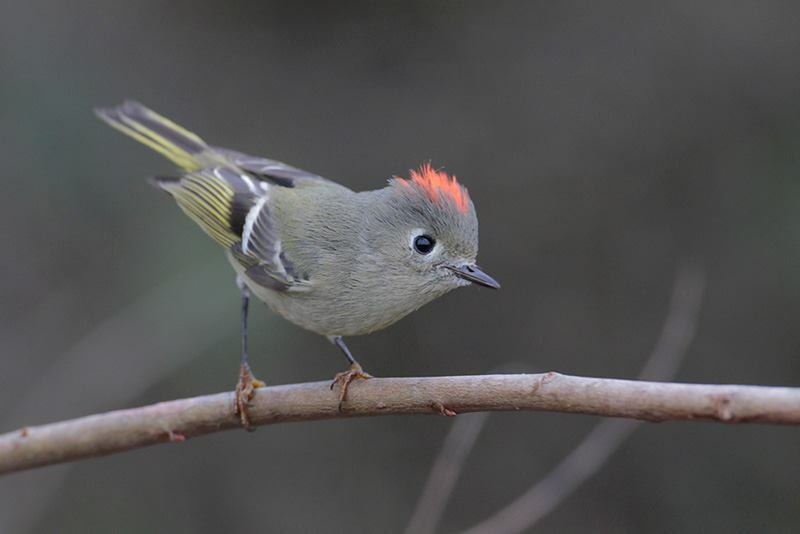 The Ruby-crowned Kinglets' nests are their best kept secret as they place them especially high in various species of coniferous trees, out of sight from predators as well as birders. This species of Kinglet can lay up to 12 eggs per nest. 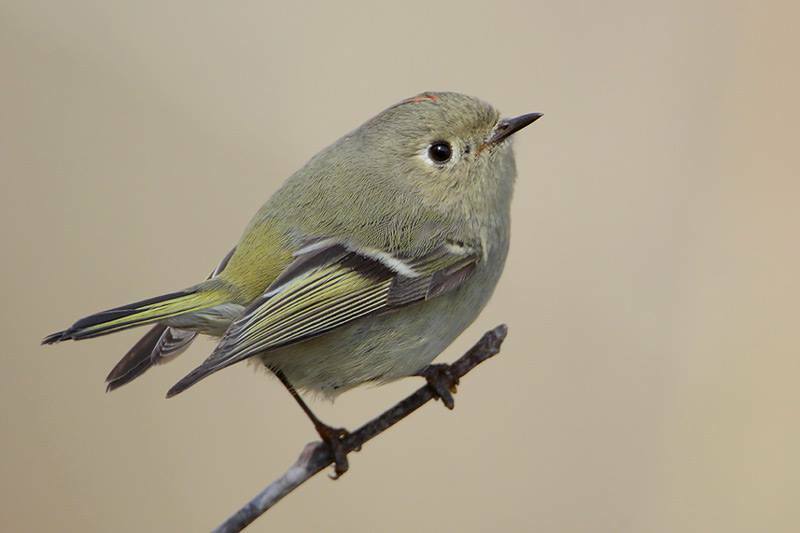 Ruby-crowned Kinglets are almost constantly flicking their wings as they hover over tree branches while pecking and foraging for various insects such as spiders, wasps, ants, bark beetles, and aphids. Even though this species tirelessly flies from branch to branch, scientists have found that they only burn approximately 10 calories per day! If you visit one of Houston Audubon Society's various bird sanctuaries, you have a great chance of seeing this energetic behavior for yourself!